Today Teena and I went to the Round House Craft Beer Festival. This is our second time going and the third for Steam Whistle who hosts the festival. We were at their first annual winter festival back in January, which was a blast. Eighteen breweries were set up for us to sample in a beautiful park with a great view of the CN Tower and Rogers Centre where the Jays won a 6-5, 19 inning game today! The nice thing about going on a Sunday is that there are less people. Yesterday was sold out. We were there shortly after the doors opened and had the run of the place. As the day went on the crowd grew but never felt crowded. Here are some beers that I sampled. A Big Rig IPAAAA. Big Rig is named after Chris Phillips who plays for the Ottawa Senators and is nicknamed Big Rig. He is part owner. A Sunlight Park Grapefruit Saison from Left Field Brewery. A Festivale from Left Field Brewery. It was time to eat. 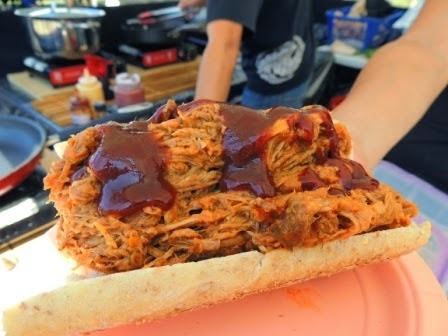 Teena had a delicious pulled pork sandwich. I went to this food truck and had a great schnitzel sandwich. Yes, I would buy this again anytime! More beer! First a Thrust! IPA from Great Lakes Brewery. I love Black Oak's Summer Saison but they sold out yesterday, a disadvantage of going on Sunday. Their 10 Bitter Years, which I had instead, is always great! Nickel Brook Brewery are doing great things in the past year. I loved their Payson Saison. Music was provided by the Honeyrunners, a cover band who I really enjoyed. There is a a scale model train that takes people around the park every weekend. If I could have taken my beer, I would have taken a ride. I love the old oil can! Hmm! Maybe I'll become an engineer when I retire! 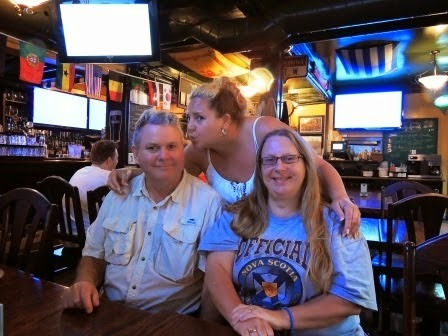 Afterwards, Teena and I met up with our friend, Shawna. I owed her wings and a beer from last year's Grey Cup game. I am a Tiger Cat fan and she is pure Roughrider. Yes, they kicked our butts! Today was fun. It was a good show and we`ll be back next year. My three favorites of the day, in no order were, 10 Bitter years from Black Oak Brewery, Payson Saison from Nickel Brook and Big Rigs IPAAAA! I'm also looking forward to the next winter festival!